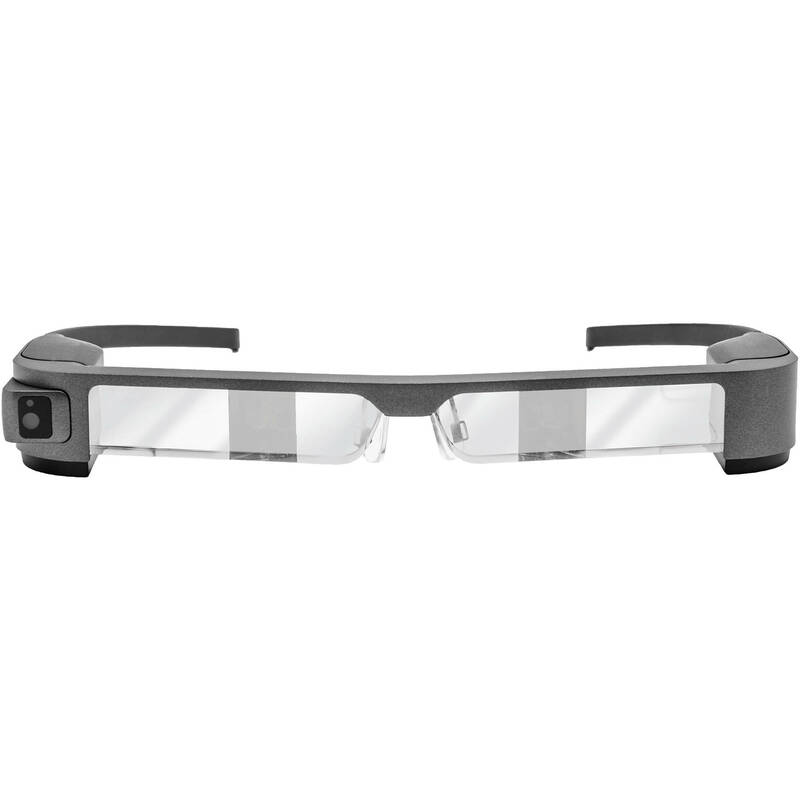 Get the best of both worlds with the Moverio BT-300 Drone FPV Edition Glasses from Epson. Normally when piloting a drone, you have the ability to look up and see your drone while FPV footage streams to a display on your controller, or you can wear a headset to get a fully immersive first-person experience. With Moverio BT-300 you get both! The glasses showcase FPV footage with overlaid flight data but are transparent so you can watch your drone fly and more easily avoid obstacles. The Moverio BT-300 glasses are a DJI-certified accessory, so you can feel more confident in pairing them with your favorite DJI drone. Custom clips are designed to securely hold the Moverio controller to your DJI Mavic, Phantom, or Inspire remote. The inclusion of a dark lens shade lets you use the Moverio BT-300 glasses even on sunny days. The Si-OLED-powered, binocular Moverio BT-300 glasses are meant to remain comfortable while being worn for extended periods of time, thanks to them weighing only 2.5 oz. They are also designed to fit over a wide range of prescription glasses, so more people can get in on the action. With the BT-300 glasses being DJI-certified, they are optimized to work with a host of DJI-compatible apps. DJI GO comes preloaded, and more can be found on the Moverio Apps Market. Record your drone's flight from your point of view, to share with others or to review your performance. The front-facing camera captures what you see in up to 1080p Full HD resolution at 30 fps. 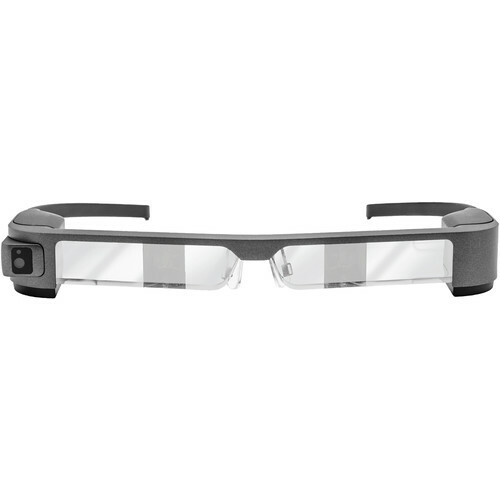 The Moverio BT-300 glasses are a versatile product that can be used for more than just drone piloting. Thanks to Epson's Android-based system, you can use the glasses for browsing the web, streaming videos, or playing games. Please note that they don't support the Google Play Store or other Google Mobile Services directly. The BT-300 FPV glasses are designed to give you the freedom to take them where you want. Built into the controller is a rechargeable battery that delivers up to six hours of battery life. When recording footage, you can save it to an (optional) microSD card. The built-in card slot accepts cards up to 32GB in size. Box Dimensions (LxWxH) 9.4 x 8.9 x 5.0"
Moverio BT-300 Drone FPV Edition Glasses is rated 3.7 out of 5 by 3. Rated 4 out of 5 by William from So far, so good Ive used these glasses a couple of times, and I like them. Like other reviewers, I was a bit frustrated by the touchpad. It is rather sensitive at times recording inputs I didnt intend to record. That is extremely aggravating when trying to type in data (i.e. email address, password, etc.) It makes these tasks slow, and when it records a false enter message, you start over. However, after initially getting everything set up and running, flying the aircraft is not as tedious. You only need to slew over an icon and tap it. No data entry necessary for flying, So, for the touchpad my ratting would be two stars, but because I love the concept of the heads-up display so much, I gave it an overall four. Rated 2 out of 5 by Josh from Sharp image (if you dont wear glasses) These FPV glasses are either defective or they do not work with glasses as they are supposed to. You cant see the edge-to-edge image which is mandatory for flying a drone. Since this is what these glasses are designed for, dont bother with them if you wear glasses. Contacts maybe, but not glasses. Rated 5 out of 5 by Daniel from BT-300 good item, quick turn around, good service! !